WINGS for Warriors is pleased to announce the success of Matt Bryant, one of its former students. 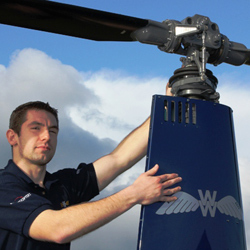 After sustaining a life-changing injury whilst on an active tour of duty, Matt fought against the odds and secured a job as a fully qualified commercial helicopter pilot with support from the charity whose aim is to inspire our wounded warriors to move past injury and achieve new, bright and sustainable futures. Matt explained: “I was injured in a gun battle in Helmand Province. I had two years of recovery, operations and rehabilitation but I was alive. When I was told that I was to be medically discharged, I had no idea what I could do or how I was going to live. “I heard about Wings for Warriors and I had a trial flight which I passed, along with my CAA medical and suddenly I had the hope of a future again, a future as a helicopter pilot. After the longest time feeling bleak and depressed I actually felt some hope.